This listing is for 50 pieces of these gorgeous 6mm top drilled lentil beads with an etched textured feature in a crystal brown rainbow color. 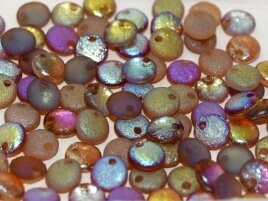 Mmm, gorgeous mix of colors, texture and luster in these beads. I'm very pleased with my entire order, thank you so much for sending it to me so quickly, too.